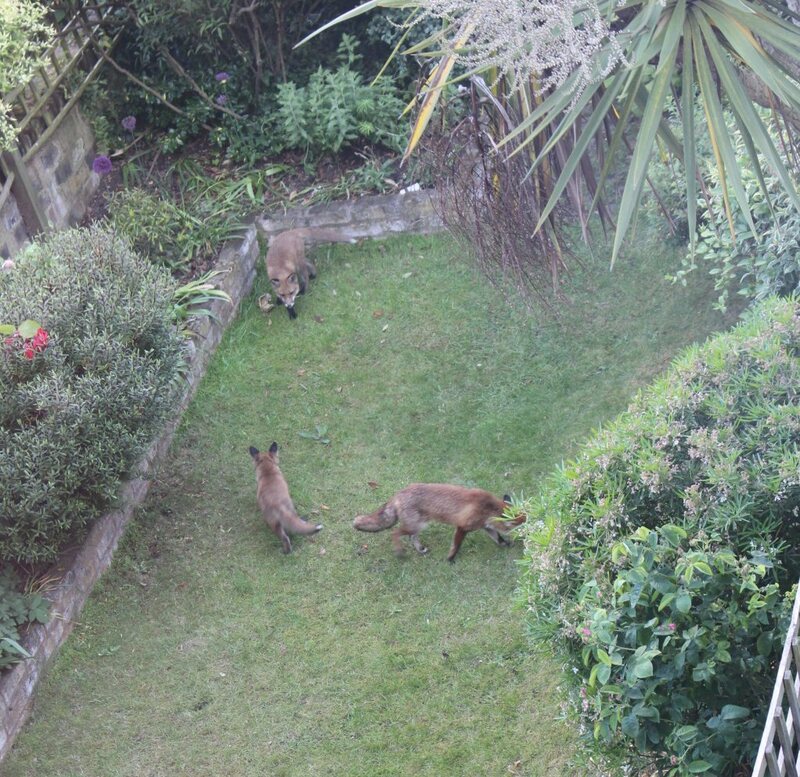 It was rather ironic that I went down to London to see how much wildlife gardening was evident in the Chelsea Show gardens, only to be kept awake the night before by the wild foxes in my mother-in-law’s garden in Hackney. She is being driven mad by them. Two dear little foxcubs galloping, shrieking and growling, chasing around their mother, romping from garden to garden over dustbins and sheds, furiously digging up bulbs and destroying flowerbeds. I can understand why some people do not enjoy the closeness to wildlife in their small urban gardens. Having a large rural garden myself, I find the badgers and foxes, though they do travel through to inspect what’s dropped under the bird table, don’t stay around and make a lot of noise. The blessed pheasants do though! I think the male does his explosive chicken noise and flap his wings at 4am. to frighten the other birds off the feeders. But maybe, I thought the other day, he regards my lawn as his ‘lek’, because he always has a couple of females in tow. Of course a garden is really like a woodland clearing for wildlife, even in an urban situation. The damage the foxes can do to once plant-filled garden beds! 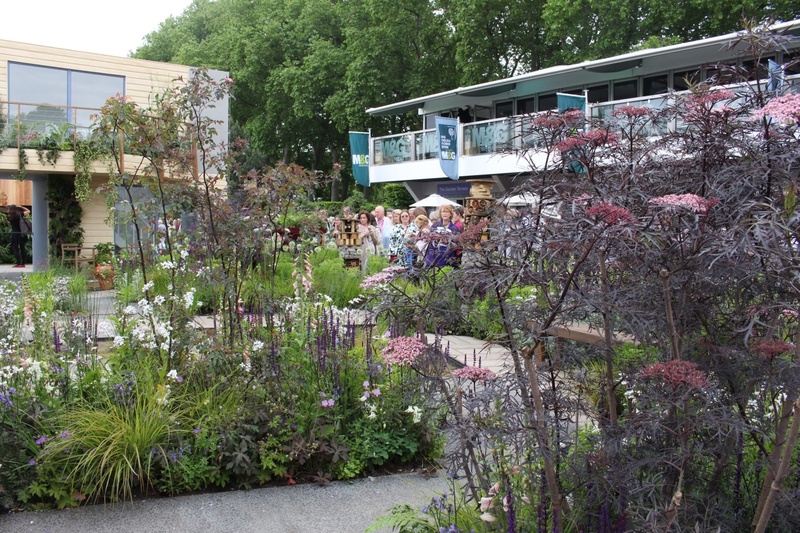 They said there’s a lot of ‘landscape inspiration’ at Chelsea this year, and there certainly was more wild habitat evident than I ever remember at a garden show before. Perhaps it is cheaper to do than all those grand hard-landscaped gardens of pre-Brexit sponsorship days. But whatever the reason it is very welcome to those of us who want to see more understanding, conservation and appreciation of wildlife gardening. 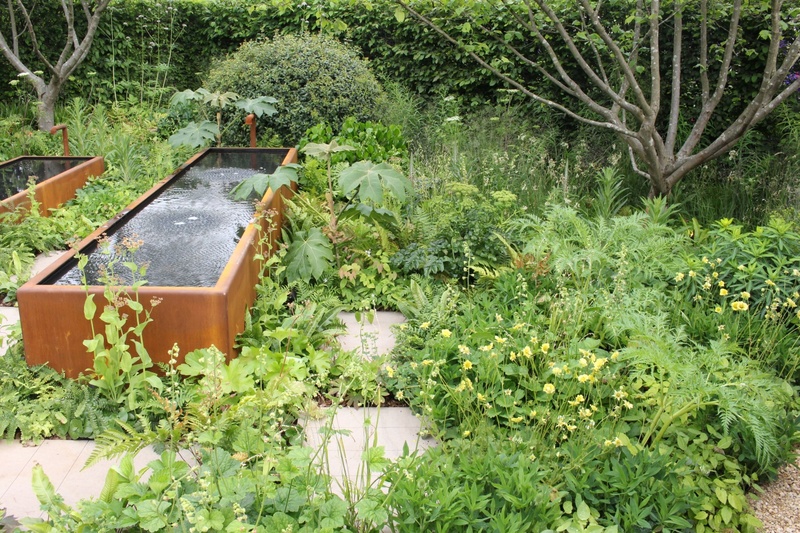 One of my favourites was the ‘Breaking Ground’ garden designed by the Wilson McWilliam Studio. When I saw it on TV before I was not taken with it- much bare ground, and jagged metal framework seemed to dominate. This garden, along with a couple of others, had a mental health and gardens theme, but it occurred to me that rather than emphasizing the pain of depression or cancer with ugly structures, it would be much more useful to emphasize how therapeutic watching and studying wildlife in the garden is. 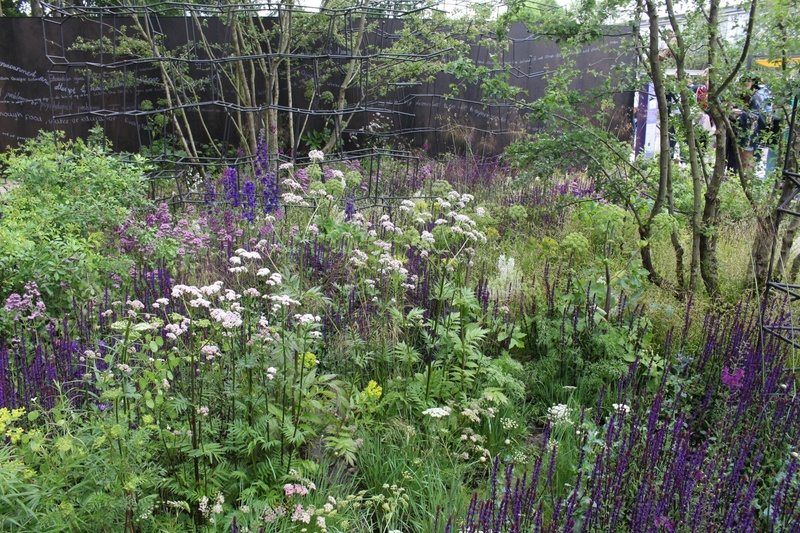 But standing down at the edge of the meadow area in this garden was magical - a gorgeous haze of purple salvia spikes, pink marjoram and tall white valerian, emerging from ferns and grasses and some native trees. 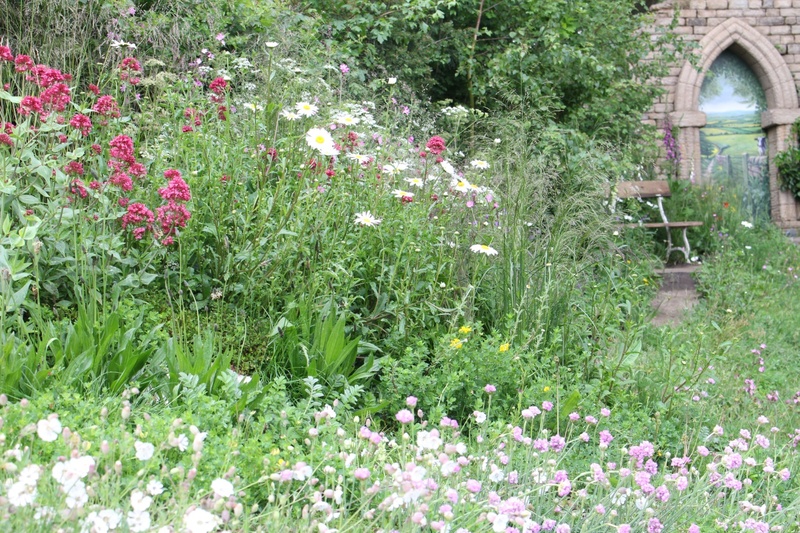 An exuberant yet natural feeling meadow, much appreciated by visiting bumblebees too. It confirmed my long-held idea that wildflower planting can be greatly enhanced and the nectar availability throughout the season extended, by including non-natives (or what we often call ‘garden plants’) amongst the wildflowers. As long as we keep them in our gardens and don’t allow invasive alien plants to spread into the countryside. In fact one of the first things I noticed at the show this year was the number of bumblebees. 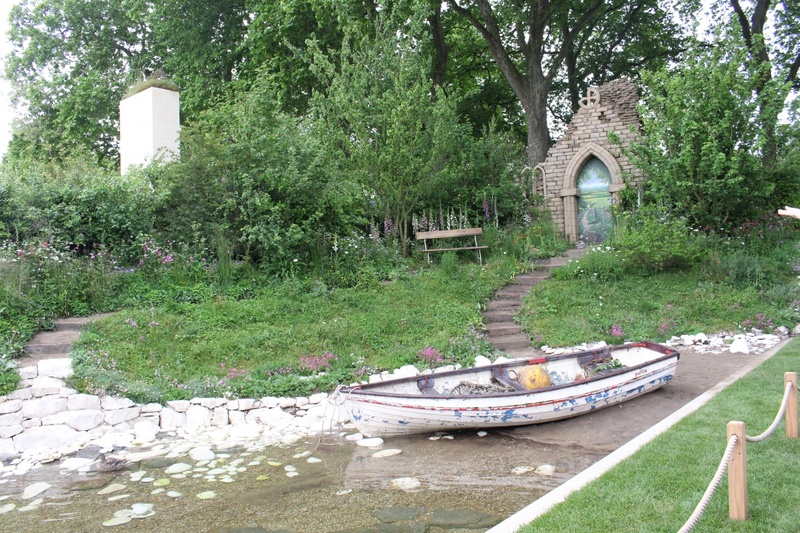 I saw them again on the ‘Greening Grey Britain’ garden by Nigel Dunnett; he was famous for the pictorial meadows he created on the 2012 London Olympic Park. Nigel also used many wildflowers from different countries- notably America , to extend the flowering season because the Olympics took place in August and most of our native wildflowers have got to seed by then, they have to get on with growing next year’s plants before the frosts. Why this doesn’t apply to all the American prairie flowers like Coreopsis and Echinacea I still don’t understand- they have much fiercer winters than us, and they start about the same time. Anyone have an explanation? The RHS project ‘Greening Grey Britain’ is ‘a nationwide call to action to transform grey unloved spaces into planted up beautiful places that will see improved health and wellbeing, and help the environment and local wildlife. I absolutely agree that many of our grey concrete towns need more plants to enhance them. But I am also cautious of too much prettifying of brownfield areas, because they are in fact refuges for 14% of our Red Data species now- as much as ancient woodland, and far more important for our wildlife than our intensively farmed countryside. Brownfield, or waste, derelict areas often have a mosaic of hard surfaces, concrete, tarmac and gravel, that enable cold-blooded invertebrates and insects to bask and warm up so they can function. They also provide sandy ground for mining bees (which most of the important pollinating bees are) and other creatures that need to make burrows. Wildflowers pop up naturally without being weeded out, and these provide both larval food plants for butterflies and moths as well as nectar. 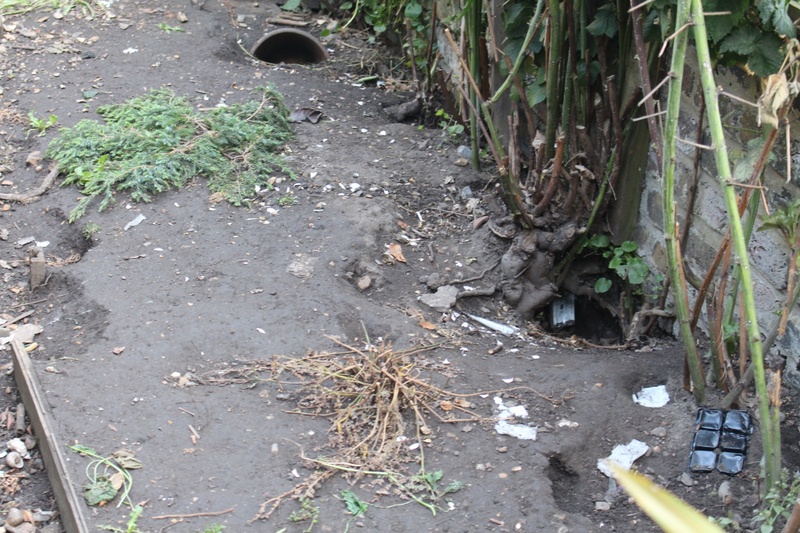 So we should really be enhancing our ‘unloved’ waste areas (and old buildings that provide roost sites for endangered bats and birds) with more of an eye towards conserving the best of what is already there, rather than replacing it wholesale with geraniums and begonias. 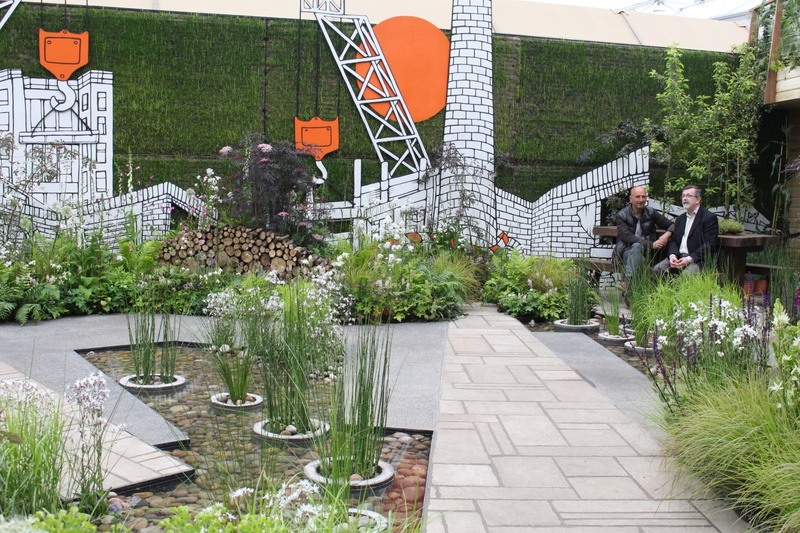 Having said that, Nigel Dunnett’s garden did have some good ideas in it, although I found the big orange blobs in the mock industrial background far too distracting, and the middle a bit empty. Nigel Dunnett (left) in his ‘Greening Grey Britain’ garden. On the way to the show I had made out a list of essential features for wildlife I would be looking for in the gardens. My list was; water, food (nectar, seeds, larval plants, inverts like worms etc. ), shelter (from extremes of weather like heat, drought, cold, wind, rain etc.) basking and breeding sites, different temperature gradients, a mosaic of habitats close to each other and lack of the use of pesticides. "Greening Grey Britain" satisfied most of these criteria. 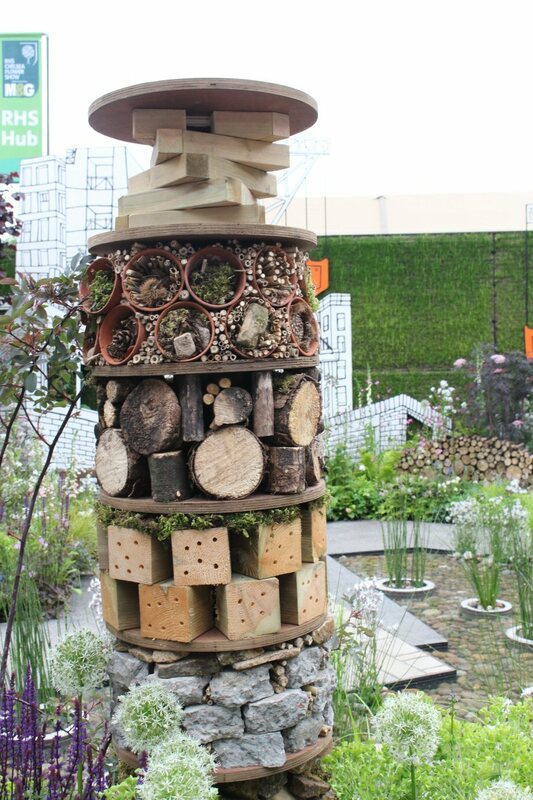 Interestingly the Friday TV coverage of Chelsea also featured Ellie Harrison talking about the essential things for a wildlife garden; she said start with getting your invertebrates in and they will feed everything else. The second thing is trees- or even just one tree if you don’t have room for more. This provides habitat for many insects to breed on, and the third thing is water. The ‘Welcome to Yorkshire garden’ even Lots of bees visiting Yorkshire! 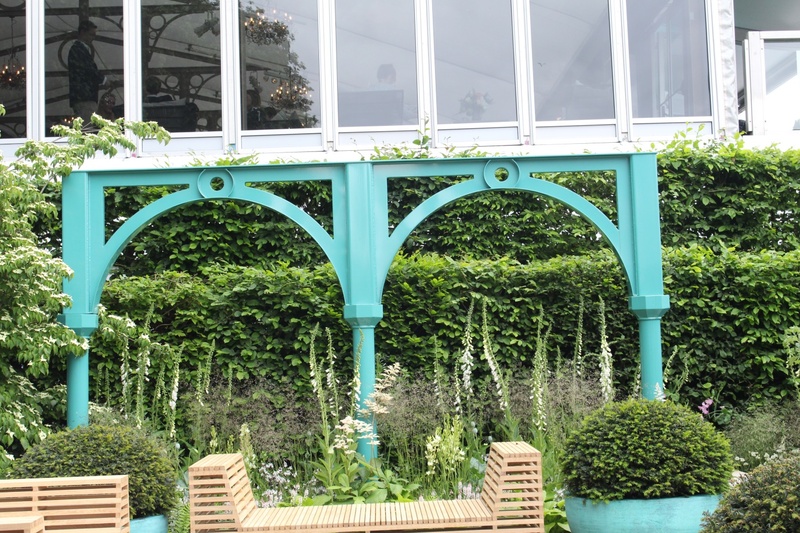 James Alexander Sinclair’s design for the Zoe Ball Listening garden was also full of wildflowers. James has spoken at one of our Wildlife Garden forum conferences on the changes he has seen as a judge of Chelsea gardens over the years towards wildlife harmony. (see www.wlgf.org for previous conference presentations) This garden had the added element of vibration that manifested itself in the water and the gravel the visitor could step on. 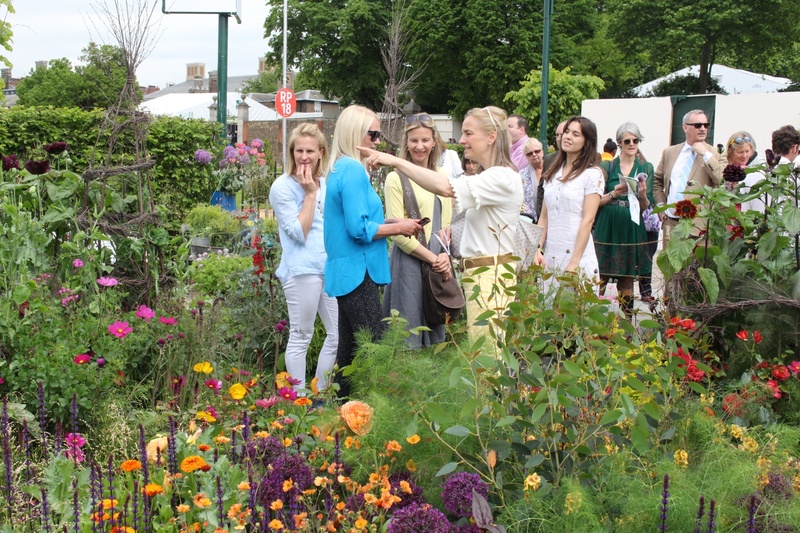 Another supporter of the Wildlife Gardening Forum, Sarah Raven, also designed one of the Radio 2 DJ’s gardens- Colour in the cutting garden for Anneka Rice. 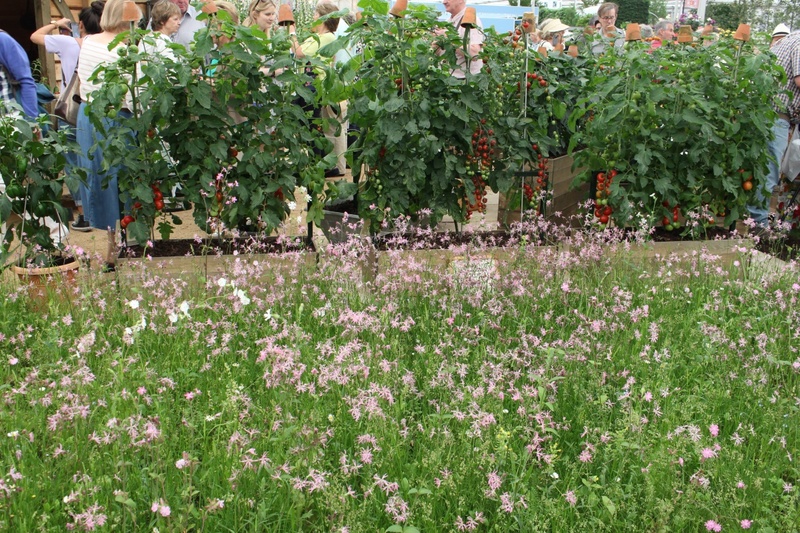 One of the interesting things she said was that ‘if you can see the centre of a flower, it will be good for insects’ – some research we have done at wlgf with Which? Gardening magazine has shown that not necessarily all double flowers nor all pollen-free flowers are useless for insects- often they retain their nectaries. Feathery fennel leaves not only make a fine foil for Sarah’s bright coloured flowers, and would be beautiful in a vase with them, but is also the larval foodplant of one of our rare species of butterfly – the Swallowtail, although not for the threatened British sub-species which only eats milk-parsley. With climate change more of these large species that need heat, but not too much, are fetching up on Southern British shores nowadays, coming over from the continent. So if you have fennel (or dill) in the garden you will be ready if they arrive to lay their eggs! 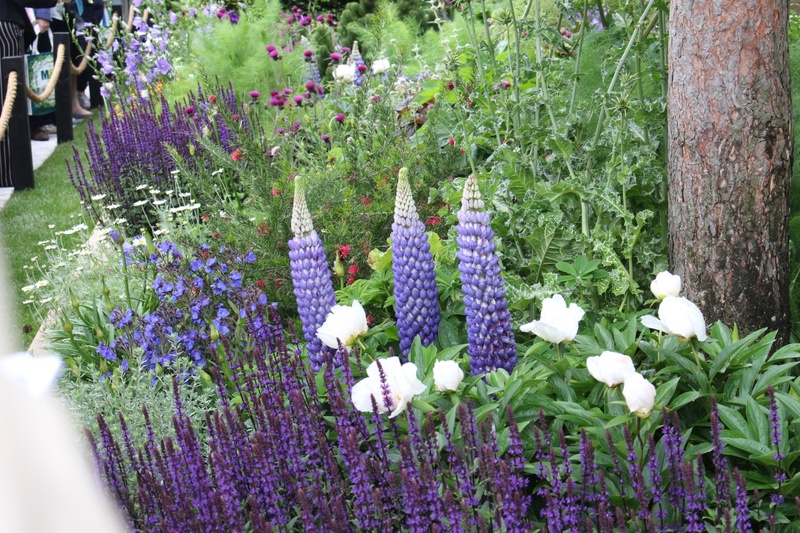 Chris Beardshaw’s garden was one of my favourites (and the public’s), but would have been even more glorious if only the echiums had not gone over! These tall spires are packed with blue tubular flowers that all bees find irresistible; they are not always hardy in the British climate, but will easily survive in pots brought into an unheated greenhouse for winter. You can grow their native species Viper’s Bugloss easily from seed, and they provide fabulous blue tubes for bees. A Ragged Robin damp meadow – Skipper butterflies love them. 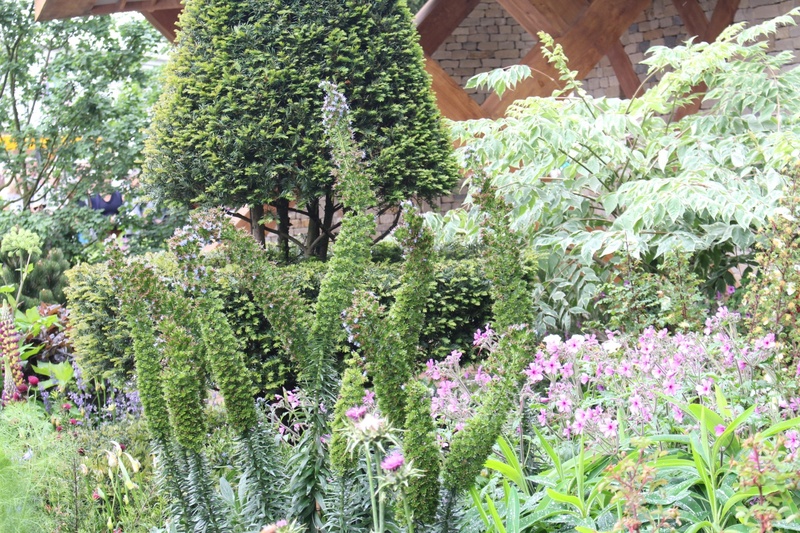 Well these are just some of the main wildlife friendly features I noticed in the show gardens this year – definitely seems to be an increasing trend, which is wonderful to see. And having been awakened at 6am. by the foxes, I was able to get to the show for the show opening at 8am. and was done by 11.30, just as the crowds became totally shoulder-to-shoulder, when Chelsea stops being pleasant anymore, and I made my way home tired and satisfied.